There are a myriad of educational choices for parents in Luxembourg but these may be limited by the age of the child concerned, where they are already in their studies, whether they can speak or write in a language foreign to their mother tongue, the preferred language of education and/or whether the parents are able or willing to pay for their child’s education. For parents wanting their child to receive an education in English these choices are more limited. In this section we will provide a summary of Pre-school, Primary and Secondary schools that offer an education in English. However with the demand being increasingly high, there does seem a conscious and deliberate effort on the part of the Luxembourgish government to address this issue. The announcement of several new establishments and expansions of existing schools (in both primary and secondary sections) is just the start. The following graphic shows the current schools in Luxembourg offering the English curriculum education. Sunflower Montessori Crèche uses a Montessori Education methodology that understands that children have sensitive periods for absorbing information. Thus enabling the child to take in knowledge effortlessly. The materials that Maria Montessori devised are self-directed and provide the children with an aim for purposeful activity perfectly adapted to each stage of their development. You can learn more about this approach to learning from the Sunflowers website and in our Resources section. There are other Pre-school facilities where English is spoken as a language. As these establishments are changing all the time and it often depends on the staff you will need to speak directly with establishment. For more information see our Pre-school Education section. 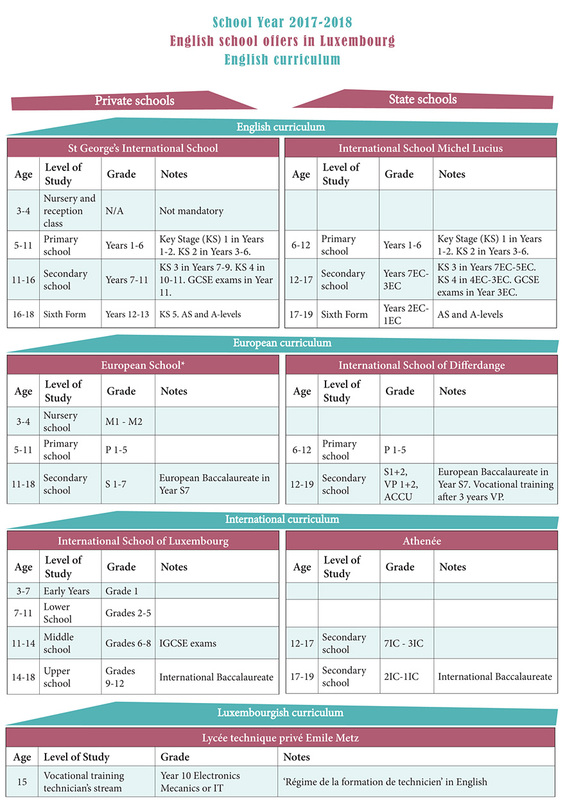 St George’s International School takes children from 3 years to 18+ years on the same campus site. With approximately 700 students from over 50 different nationalities the school provides an inclusive and diverse learning environment. The school uses the International Primary Curriculum based on the British National Curriculum preparing children for IGCSE examinations at 16 years with the opportunity to continue towards A’ Levels examinations at 18 years. These qualifications are internationally recognized and many of the students at St George’s go on to study at the University of their choice. Children can start Maternelle (Nursery) the September after their 4th Birthday and education continues to be provided through Primary and Secondary school up to 18+ years of age. There are also Crèche and Garderie (pre-school Nursery) facilities on site available for children of employees of EU institutions. It is important to note that generally parents do not have the choice whether their child attends Kirchberg (EE1) or Mamer (EE2) this is organized by catchment. What system do they teach – towards what qualifications? The first ever European school was founded, here in Luxembourg, in 1953. There are now 14 European schools teaching children across the European Union, including 2 school sites here in Luxembourg. The school teaches towards the European Baccalaureate (EB). As the school teaches in a range of European languages, children are taught in ‘Language streams’ with children’s first language generally being their mother tongue and a second language being formally introduced at the first year of Primary. There is an emphasis on multiculturalism and acquisition of other European languages. Category I: Pupils whose parents are members of the staff of or seconded to a European Institution or an assimilated organization. The employer must certify that the duration of the contract lasts for a minimum period of one year. These pupils are exempted from school fees. Category II: Pupils whose parents are members of the staff of a company or an organization which has concluded a special agreement with the European schools and certifies that it will pay the school fees for the enrolled pupil. Category III: Pupils whose parents do not belong to categories I or II and pay the requested school fee themselves. These pupils can be admitted if places are available and if they fulfill other conditions as defined by the school. Sunflower Montessori Saturday School offer reading and writing classes in English. They welcome children from 4 years. Each child is taught individually according to a specific programme which is designed for both their level and to meet their needs. They teach the letters phonetically so reading is an easy transition. A light snack is provided, with a special time for story telling and poetry. As the demand for secondary education in English has grown in Luxembourg, the Lycée Technique Michel Lucius (LTML) has created an English section with a curriculum for students with English as a first or second language. The section now accepts students from 11 years (year 7 equivalent British system) and prepares them for the IGCSE (International General Certificate of Secondary Education). Students can then go on to do preparation classes for the AS and A-level exams (year 12 equivalent British system). Children need to pass an exam in English to be accepted onto either programme. It is possible to enter the AS/A’ Level programme with English qualifications from other schools.